What do you see when you walk down the street? How do you experience your neighborhood? Here to help us take a second look at our surroundings via public, participatory walks through Pilsen are a myriad of Chicago-based artists who have recently completed a master class with artist Todd Shalom, founder of the NYC-based arts organization, Elastic City. These participatory walks are intended to make their audiences active participants in an ongoing poetic exchange with the places we live and visit. The walks use sensory-based techniques, reinvented folk rituals and other exercises to investigate and intervene in the daily life of the city, its variously defined communities and the politics of individual and group identity. Today’s artists, all a part of our Elective Studies community, will lead four such walks for the public in Pilsen on Saturday, September 17th [1PM (FULL), 2:30PM (FULL), 4:30PM (FULL), and 6PM (FULL)]. Exact location is TBD; registrants will receive an email with the address 24 hours prior to the event. Audience capacity for each walk is limited to 12 participants, so we encourage advance registration! We will begin a waiting list once each walk has been filled. This event is appropriate for audiences ages 13 and up. All walks scheduled on Saturday, September 17th have reached capacity. Elective Studies is an ongoing series for artists, designed to give them opportunities to draw inspiration from the world around them and to connect with one another. Practicing artists from around the city of Chicago gather for lectures, meals and master classes throughout the year. The artists conducting the walks in Pilsen have taken a week-long master class with artist Todd Shalom to learn the fundamentals of participatory art. More information about these artists will be available closer to the event date. To inquire about being added to the Elective Studies community, please email electivestudies@ilhumanities.org with a couple of sentences about your artistic practice. Todd Shalom works with text, sound and image to re-contextualize the body in space using vocabulary of the everyday. He is the founder and director of non-profit participatory walks organization, Elastic City. In this role, Todd leads his own walks, collaborates with artists to lead joint walks, and works with artists in a variety of disciplines to adapt their expertise to the participatory walk format. 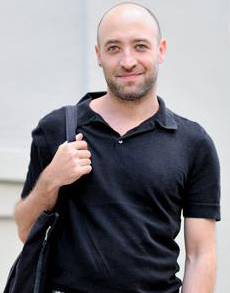 He often collaborates with performance artist/director Niegel Smith. Together, they conceive and stage interactive performances in public and private environments. Todd is also a ringleader of Willing Participant. Willing Participant whips up urgent poetic responses to current events. Todd is a member of the core faculty in Pratt Institute’s MFA in Writing. His work has been presented by organizations such as Abrons Art Center, Brooklyn Museum, The Invisible Dog, ISSUE Project Room, The Museum of Modern Art, The New Museum, P.S. 122 and Printed Matter. Todd is a graduate of the MFA Writing Program at California College of the Arts and also holds a B.S. in Business Administration from Boston University. If you require ASL interpretation or other assistance to fully participate in this program, please contact info@ilhumanities.org at least 72 hours prior to the program so that we can make accommodations. For more information, please call (312) 422-5580.